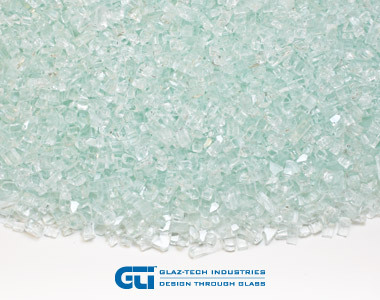 Equipped with state of the art technology, Glaz-Tech's capabilities to heat strengthen or temper glass has provided faster lead times and quality product for both commercial and residential applications. Glazers, project managers and architects can rely on various temperable products including standard clear glass, low-e, pattern, tinted and reflective glass products. Whether you are looking for a high volume of tempered shower enclosures, tempered windows, displays or knock out panels Glaz-Tech Industries provides innovative solutions so that your tempering projects remain consistent with quality. Fully tempered glass is used in many applications because of its safety characteristics. Safety comes from strength and from a unique fracture pattern. Strength, which effectively resists wind pressure and impact, provides safety in many applications. When fully tempered glass breaks the glass fractures into small, relatively harmless fragments. This is called "dicing", and reduces the likelihood of injury to people as there are minimal jagged edges or sharp shards. Glass thickness from 1/8” through 3/4” can be tempered. Glass thickness from 1/8” through 1/4” are commonly heat-strengthened. All processing work such as cutting, edgework and drilling must be completed prior to tempering. Glass cannot be cut or worked after the tempering process. GTI tempered glass can be processed in a variety of different styles, from the relatively simple ground or polished edges, to the more decorative profiled types of edgework. Other types of edgework may also be available upon request. In order to temper glass with holes, the holes must be the same size or bigger than the glass thickness. Minimum diameter for 1/8” glass is 3/16”. Contact your sales representative with questions about other laminations regarding holes, notches and cutouts. There are some characteristics of tempered glass, such as bow and warp, roller distortion, and others that are inherent to the tempering process, and are not considered defects. GTI is always improving ways to minimize these characteristics and to keep within ASTM standards 1048 and 1036. American National standard for glazing materials used in buildings - safety performance specifications and methods of test. Standard specification for flat glass. Standard specification for heat treated flat glass. Tempered float glass shall comply with ASTM C1048, Type 1, Class 1 (clear), Glass 2 (tinted), Quality Q3, Kind FT.
Tempered safety glass products in the US are to comply with CPSC 16 CFR part 1201 for category II materials.